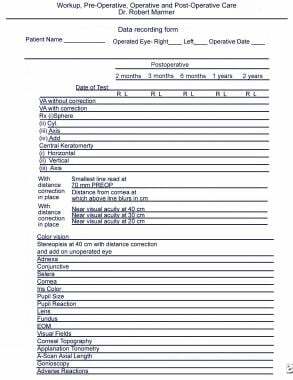 The workup for the surgical reversal of presbyopia (SRP) is expedited by a data recording form (see images below). [1, 2, 3, 4] The preoperative data can be recorded, as well as first day, first week, and up to 2-year visits postoperatively. By keeping track of the data on one form, clinical assessment of patient progress is made easier and more rapid. SRP is performed on an outpatient basis in either a minor surgical room or a surgical suite. See the images below. Data recording form (part 1). Data recording form (part 2). 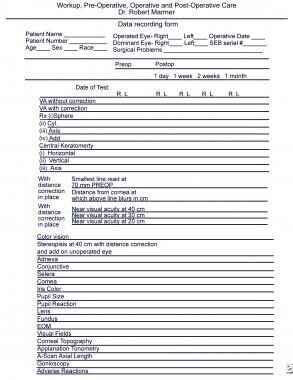 Workup for the surgical reversal of presbyopia is expedited by a data recording form. The preoperative data can be recorded, as well as first day, first week, and up to 2-year visits postoperatively. Preoperative preparation can include multivitamins and nonsteroidal anti-inflammatory medications, both topical (eg, Acular, Voltaren) and oral (eg, Celebrex, Vigamox). Antibiotic steroid drops (eg, TobraDex) or an antibiotic alone (eg, Ciloxan) can be used the day of surgery. An intravenous line is started in the preoperative area. The intravenous route allows intravenous anesthesia, such as Versed, to be administered as needed. After the second eye has been completed, 250 cc of 20% mannitol is started. Since mannitol may cause diuresis, which, in turn, may increase urination urgency during surgery, it should not be started prior to completion of the surgery. To ensure proper placement of the scleral expansion segments, it is very important to mark the 12-o'clock position on the cornea with the patient seated upright and looking in the distance. The mark can be placed with a marking pen or with a blunt forceps using a biomicroscope or loupes. In addition, a limbal vessel or nerve loop or other landmark should be observed to ensure that the surgeon is confident of the location of the 12-o'clock position. The 12-o'clock position is marked preoperatively, usually in the holding area prior to entering the operating room. The 12-o'clock position should not be marked with the patient supine because the eye can intort as much as 20°. The procedure is performed with topical anesthetic using 0.5% proparacaine and/or 4% lidocaine. Tetracaine should not be used because it weakens the adhesion of the corneal epithelium and can cause loss of the corneal epithelium. At the conclusion of the surgery, a drop of an antibiotic, such as Ciloxan or Vigamox, and a nonsteroidal anti-inflammatory drug, such as Acular or Voltaren, are placed in the conjunctival cul-de-sac. Also at this time, a drop of 0.5% or 1% pilocarpine will constrict the pupil, indicating that anterior segment ischemia is highly unlikely. The patient should be warned that the pilocarpine drop will most likely cause a brow ache that lasts at least 30 minutes. Postoperatively, it is typical to check the near vision immediately after surgery. This provides the patient and the doctor rapid feedback on near vision improvement. Acular or Voltaren and Ciloxan or Vigamox are repeated once in the postoperative area. At this time, 1% Pred Forte or Econopred Plus drops should also be instilled. Use TobraDex ophthalmic drops 4 times a day for 1 week. The patient must be seen the first day after surgery to ensure that there is normal pupillary function. The pupil should respond normally to light or be round and miotic. If the pupil is dilated and does not respond to light or if the pupil is irregular and a sector of the pupil does not respond to light, the patient may have anterior segment ischemia. Either a normally light responsive pupil or a round miotic pupil is the most important sign in ensuring that the patient does not have anterior segment ischemia. The most important signs of anterior segment ischemia are either a sector or a totally nonresponsive dilated pupil. Since the pupillary sphincter is not receiving blood, neither light nor a miotic agent produces miosis. If the patient appears to have anterior segment ischemia, administer 500 cc of 20% mannitol intravenously and place 1 drop of 4% pilocarpine in the conjunctival cul-de-sac every 2 minutes 4 times and wait 2 hours. The pupil should become round and miotic. If the pupil does not become round and miotic and the pupil remains dilated, remove all of the scleral expansion band segments. If only one sector of the pupil is nonresponsive, then remove the scleral expansion segment from that meridian. If, after the above, the pupil still remains dilated and/or nonreactive and/or the vision appears to be reduced, schedule the patient for 4-6 consecutive daily 1-hour hyperbaric oxygen chamber treatments. Near to far is better than far to near. Have patients hold the eye chart 4 inches (10 cm) from their eye. 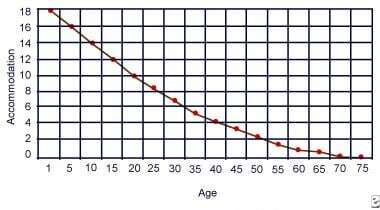 Have patients look at the smallest line they can see and then have them concentrate until they can see the next smallest line. Have patients hold fixation on the smaller line and slowly move it away from the eye until it is at full arm's length. Then, bring the eye chart toward the eye while continuously holding fixation on the smaller line until the eye chart is 4 inches (10 cm) from the eye. Patients should repeat this exercise as frequently as possible, but for at least 10 repetitions, 10 times a day, each time trying to fixate on a smaller line. Five or more minutes at each session is recommended. It is better for the patient to perform the exercises multiple times a day rather than trying to perform one long session per day. Patients should not squint during the exercises. Patients usually experience ciliary pain during the exercise. Explain to patients that this pain is a good sign and that the exercise is strengthening their ciliary muscle. If a particular patient will not exercise, use pilocarpine 0.5% or 1% twice a day, every other day, for 2 weeks. Pharmacological stimulation is not as good as the eye exercises. If a patient develops continuous ciliary muscle pain (a rare event) due to ciliary muscle spasm, a single dose of Mydriacyl 1% (tropic-amide) will break the attack. It is important that the patients do not use any reading aid postoperatively because it will weaken their ciliary muscle. Patients should always carry a penlight to read in low-light conditions (eg, a menu in a restaurant) without straining or reverting to reading glasses. To feel comfortable when reading, people tend to hold their reading material further out to relax the accommodative mechanism. [9, 10, 12] Emphasize to patients that, from now on, when they perform their normal daily reading activities (eg, newspapers, magazines, letters, office paperwork), they need to hold the reading material as close as possible but still be clear enough to read. This process will help maintain the accommodative muscle tone. Patients experience a mild brow ache for the first 24 hours. Accommodative scleral myalgia (brow ache) may occur when the patient attempts to focus on fine details at near vision. Intermittent blurry vision for distance and near, generally secondary to the alteration of the tear film layer, occurs for 2-3 weeks. Photosensitivity (1-2 wk) usually occurs. Subconjunctival hemorrhage lasts 2-3 weeks. Hyperemia, localized over scleral expansion band segments, persists for 3-8 weeks. Marmer RH. The surgical reversal of presbyopia: a new procedure to restore accommodation. Clinical and Surgical Ophthalmology. 2004 Dec. 22(12):368-72. Schachar RA. Surgical reversal of presbyopia. Surgical Manual and Scientific References. Presby Corp; 1999. Anderle R, Ventruba J. The current state of refractive surgery. Coll Antropol. 2013 Apr. 37 Suppl 1:237-41. [Medline]. Lindstrom RL, Macrae SM, Pepose JS, Hoopes PC Sr. Corneal inlays for presbyopia correction. Curr Opin Ophthalmol. 2013 Jul. 24(4):281-7. [Medline]. Lim CH, Turner A, Lim BX. Patching for corneal abrasion. Cochrane Database Syst Rev. 2016 Jul 26. 7:CD004764. [Medline]. [Full Text]. Ross M, Deschênes J. Practice patterns in the interdisciplinary management of corneal abrasions. Can J Ophthalmol. 2017 Dec. 52 (6):548-551. [Medline]. Acar D, Molina-Martínez IT, Gómez-Ballesteros M, Guzmán-Navarro M, Benítez-Del-Castillo JM, Herrero-Vanrell R. Novel liposome-based and in situ gelling artificial tear formulation for dry eye disease treatment. Cont Lens Anterior Eye. 2018 Feb. 41 (1):93-96. [Medline]. [Full Text]. Gokul A, Wang MTM, Craig JP. Tear lipid supplement prophylaxis against dry eye in adverse environments. Cont Lens Anterior Eye. 2018 Feb. 41 (1):97-100. [Medline]. [Full Text]. Atchison DA. Accommodation and presbyopia. Ophthalmic Physiol Opt. 1995 Jul. 15(4):255-72. [Medline]. Koretz JF, Kaufman PL, Neider MW, Goeckner PA. Accommodation and presbyopia in the human eye--aging of the anterior segment. Vision Res. 1989. 29(12):1685-92. [Medline]. Olsen TW, Aaberg SY, Geroski DH, Edelhauser HF. Human sclera: thickness and surface area. Am J Ophthalmol. 1998 Feb. 125(2):237-41. [Medline]. Schachar RA, Tello C, Cudmore DP, Liebmann JM, Black TD, Ritch R. In vivo increase of the human lens equatorial diameter during accommodation. Am J Physiol. 1996 Sep. 271(3 Pt 2):R670-6. [Medline]. Schachar RA, Huang T, Huang X. Mathematic proof of Schachar's hypothesis of accommodation. Ann Ophthalmol. 1993 Jan. 25(1):5-9. [Medline].